Quotes honoring Pride and Prejudice’s 199th Birthday! I could not let this day pass without wishing Jane Austen’s novel, Pride and Prejudice a happy 199th birthday. Written between October 1796 and August 1797, Pride and Prejudice was first entitled First Impression and would not premiere on the printed page until after many revisions and another sixteen years. Publisher Thomas Egerton of Whitehall (London) purchased the copyright from Jane Austen for £110 (worth £3,735.60 or $5,867.77 today). She would make no further pecuniary emolument from her most popular novel in her lifetime. These are only a few of the amazing moments in Pride and Prejudice. Did I miss some your favorites? If so, do share. Great idea to commemorate the occasion! One of my favourite lines is the first one in Chapter 61: “Happy for all her maternal feelings was the day on which Mrs. Bennet got rid of her two most deserving daughters.” I love that this is all Austen has to say about the wedding day itself. There are so many, but I’ve chosen this one to add to your list: “I have said no such thing. I am only resolved to act in that manner, which will, in my own opinion, constitute my happiness, without reference to YOU, or to any person so wholly unconnected with me.” (Elizabeth to Lady Catherine) You tell her Lizzy! Great list Laurel Ann! Love them all, but here’s my pick to add: “I have said no such thing. I am only resolved to act in that manner, which will, in my own opinion, constitute my happiness, wihtout reference to YOU, or to any person so wholly unconnected with me.” (Elizabeth to Lady Catherine) You tell her, Lizzy! I see these comments showed up after all. Sorry for the redundancy. What a lovely beginning to start my Sunday morning. Lovely, Happy Birthday to Pride and Prejudice! I took out a Kindle Nation ad for my mashup “Pride and Prejudice: The Jewess and the Gentile” (http://tinyurl.com/7r6x5bky) yesterday, but alas, they forgot to include my birthday wishes. “”Your good opinion is rarely bestowed, and, therefore, more worth the earning!” (also, Darcy to Elizabeth). What a delightful way to start the day, and I anticipate that it will just keep on this way, on this blog, anyway! Happy Birthday Pride & Prejudice!! You are one of my favorite novels ever and I love anything Jane Austen!! Congrats! Can’t wait for the year-long party next year’s anniversary will launch! I also like the question posed by Lady Catherne de Bourgh – are the shades of Pemberley to be thus polluted? Oh I love that question Ann, Lady Catherine de Bourgh is such a wonderfully composed Character in the book. And I so love how Elizabeth just doesn’t care about how much money she has, she puts Lady Catherine in her place. Happy Birthday to my favorite book ever! I always smile when I read the opening sentence (quoted by Ann Dawson above). Thank you Laurel Ann; you have covered most of my favourite quotes . If I may add one that is often forgotten- from the scene at Netherfield, when Darcy and Elizabeth are sparring about human faults and follies-after Miss Bingley declares that Darcy cannot be “laughed at” – he has no weaknesses. Darcy’s reluctant admission that he has perhaps one weakness – ” My temper would perhaps be called resentful. My good opinion once lost is lost forever.” brings a remarkable response from Elizabeth, ” That is a failing indeed! Implacable resentment is a shade in a character. But you have chosen your fault well. I really cannot laugh at it.” It immediately deepens the tone of the conversation from teasing to reality as both Elizabeth and Darcy are rather uncomfortable, having revealed more of themselves than perhaps they intended to. It’s their first serious encounter. The 1796/97 date has a special significance for me- it was exactly 200 years later ( August 1996 ) that I began work on The Pemberley Chronicles. 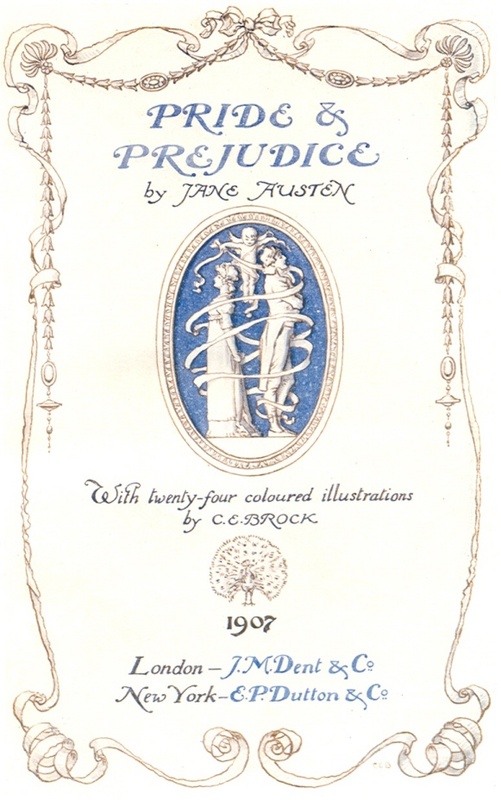 I look forward to the 200th anniversay commemoration of the publication of Pride and Prejudice with much anticipation. “Oh! if that is all, I have a very poor opinion of young men who live in Derbyshire; and their intimate friends who live in Hertfordshire are not much better. I am sick of them all. Thank Heaven! I am going to-morrow where I shall find a man who has not one agreeable quality, who has neither manner nor sense to recommend him. Stupid men are the only ones worth knowing, after all.” Miss Austen displaying her devastating wit again…. I loved all of your quotes, Laurel Ann. It is hard to pick a favorite, so very hard. I suppose if I had to I’d pick the conversation when Darcy again asks Lizzy if her feelings have changed since last April and her response. It’s that moment when you know that they’re finally coming to the realization that their only contentedness will be found in each other. But Jane Austen just dazzles us with so many ironic sentences and comedic comments. Happy Birthday, Pride and Prejudice, my favorite novel of all time. Can’t wait for next year’s celebrations!